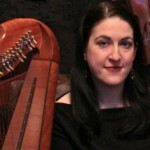 Eileen Gannon specializes in the playing of traditional Irish music on the Irish harp. Under the tutelage of Tracey Fleming, Eileen won several medals in International competitions. And in 2000, she was the All-Ireland Senior Harp Champion. She was the first performer from the midwest and only the third American to win this prestigious world title. Several of Eileen’s students have also won honors in All-Ireland competitions. 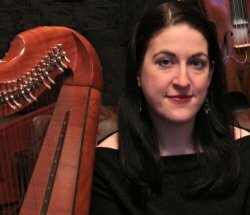 Eileen studied classical harp with Laura Hearne and received a Bachelor’s degree in music performance from St. Louis University. In 2001, she received a master’s degree in Ethnomusicology from the University of Limerick. She also holds the TTCT teaching certificate awarded by Comhaltas Ceoltoiri Eirreann. Eileen was a member of the St. Louis Symphony Youth Orchestra and has performed with the Clayton and University City Symphony Orchestras. Eileen has also appeared with the Musical Diversions Society Orchestra and the St. Louis Women’s Chorale. While studying in Ireland, Eileen taught at the Limerick Municipal School of Music and performed regularly at Dromoland and Bunratty Castles. She has taught at Scoil Éigse and at several Tionols and currently teaches for Springboard to Learning and St. Louis Irish Arts. She is a member of Local 2-197 of the American Federation of Musicians, and there is great demand for Eileen to play at events of all kinds both as a soloist or member of an ensemble. Eileen resides in St. Louis, Missouri.